The world is at war and Ciri, the child of prophecy, has vanished. Having taken the disguise of a bandit, Ciri believed herself to be free from her enemies and her destiny, but her freedom is short lived as friend and foe alike search for her. The witcher Geralt is scouring the land in search of the princess with help from a band of allies. Mercenaries have been hired from both sides of the war to find and capture her. There is only one place left for Ciri to run to: the tower of swallows. 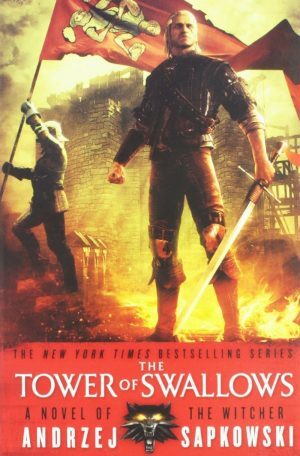 The ever-talented Andrzej Sapkowski has released yet another wonderful addition to his epic fantasy series with The Tower of Swallows. While it does not hold as much action or humor as its predecessors, Sapkowski’s fourth installment still holds plenty of fantastical action while taking a more serious route. The war that has been foreshadowed has finally arrived and readers get to learn more about what is to come. The story as a whole is, once again, well-written and well-executed. As with previous books of the series, the characters really help to bring this story to life. Most of the main characters readers have come to know have equal amounts of spotlight time; however, one character receives more spotlight time than any other: Ciri. Ciri has been a vital part of the series since The Last Wish, but has only been given minimal attention. It is a pleasant surprise the amount of spotlight time Sapkowski gives to Ciri and readers will thoroughly enjoy learning more about her, even though her tale is not an entirely pleasant one. Even with the more serious route The Tower of Swallows takes, there are still plenty of excellent action sequences and also more storytelling that will fascinate readers. The Witcher series is known for incorporating well-known tales and legends within its books and more mythological tales are revealed in this one. The impending Frost that has been briefly mentioned in earlier books of the series is nearly upon the land as is the war. This is finally explained more in depth through what seem to be stories from Norse mythology. This is a wonderful addition to the tales and legends already hinted at within the series and one fans of mythology will love. The only somewhat downside of the story may be that parts can become confusing at times. Similar to the second installment of the series, The Time of Contempt, readers are given more politics about the war that can either be confusing or drawn out to the point of monotony. Also, many characters are mentioned whose names may sound familiar, but may be difficult for readers to place who said characters are. Regardless of how readers take this information, it is vital information to know for the main plot of The Witcher series. Master storyteller Sapkowski has yet to disappoint in his epic fantasy series. With more information revealed to the readers about the war, the so-called “end times,” and the princess who is destined to bring about or stop that time, The Tower of Swallows is an excellent addition to The Witcher series. Readers will keep reading, longing for the time to come when Geralt, Yennefer, and Ciri can be together as a family and for the time when Sapkowski’s amazing fantasy world is no longer at war. The story does end in a way that will make readers wish to read the next in the series, Lady of the Lake, but will not have to wait long as it is set to come out next spring.